Hello ducky! 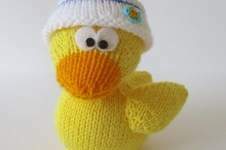 With this knitting pattern you can knit your own cuddly ducky with a jaunty sailor hat. FINISHED SIZE: The duck is approximately 14cm tall and 11cm long (without the hat).